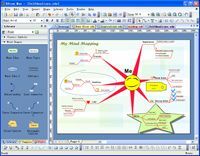 EDraw Mindmap is a quick and easy vector-based mind mapping freeware for creating great-looking and professionally-looking mind maps, whichis the graphical representations of thought processes for brainstorming, problem solving, rational analysis, and decision marking. EDraw Mind Map includes bunch rich of ready-made graphics, examples and templates for easy drawing by just stamping to the mind map. With EDraw Mindmap mind mapping software, user can easily create basic flow charts, mind map, brainstorming diagram and sketch map. With the mind map program, user can write down a central idea, and then think up new and related ideas which radiate out from the center. User can then use the diagram to visualize the thinking, looking for branches out and connections between ideas, and quickly arrange and organize your work or remember new information.